A great college football offense begins and ends with the offensive line. The five guys in the trenches can make a good team great and they can drag a team down if they aren’t prepared. Tennessee’s offensive line needs all the help it can get after a season where it allowed 35 sacks and could only muster 117.42 rushing yards per game (13th in the SEC). Thankfully, things are looking a bit more promising for the o-line under Jeremy Pruitt’s new regime. First things first, the change at offensive line coach from Walt Wells to Will Friend is a big upgrade. Wells wasn’t necessarily bad, Friend is just very good. During Friend’s time as the offensive coordinator at Colorado State, he had some phenomenal offenses and before his stint at CSU, he coached some top-notch o-lines at Georgia. He has the experience and expertise that could turn around Tennessee’s ailing offensive front. New head coach Jeremy Pruitt even specifically pointed out how much the o-line improved during the spring under Friend’s leadership. So, that’s a good place to start when analyzing this unit. Now to the players themselves: When I look at the line as a whole, there’s really only one certainty. Trey Smith. Despite an offseason battle with blood clots in his lungs that kept him out of spring practice, you truly can’t overstate how important he is to this team. ESPN analyst Cole Cubelic named him as the best offensive tackle in the SEC and Athlon Sports gave him preseason All-American honors. He gained tons of other accolades after a terrific freshman campaign in 2017, and ideally, he will only get better with time. There is a possibility Trey could be rusty early in the season, having missed the spring and being limited to non-contact work for a portion of fall camp because of his aforementioned health problems, but expect him to round back into the star he was a year ago as the year progresses. Grad transfer Brandon Kennedy has lots of unknowns but he was Alabama’s backup center before coming to Knoxville and it’s never a bad thing to play for a national championship winning squad. It appears that Kennedy knows how to put in the work to be the player he needs to be and he brings a fair amount of experience to a unit that’s packed with question marks. In total, Kennedy played in 10 games during his three years in Tuscaloosa and at the moment, he’s the presumed starter at center for UT. With his frame and potential, there’s no doubt he should be a key cog in the Vols’ offensive front. Much like Kennedy, the rest of Tennessee’s offensive line simply has to go out and prove itself. Chance Hall is still coming back from injury but he is expected to play a meaningful role in the coming season if he can get healthy. Drew Richmond was very highly touted when he came to UT but in two years on the field, he hasn’t fully lived up to the hype. We’ll see if the guidance of a new coaching staff helps Richmond finally emerge. Marcus Tatum has plenty of upside and has started in three games in two years but he hasn’t yet showed what he’s truly capable of. Ryan Johnson and Riley Locklear have similar stories to Tatum, they came to UT as highly regarded recruits and were forced into action early. They’ve played some but still have a long way to go developmentally. Junior college transfer Jahmir Johnson could be an immediate contributor with his skill and prior experience. Also, former four-star recruit Jerome Carvin could get playing time. 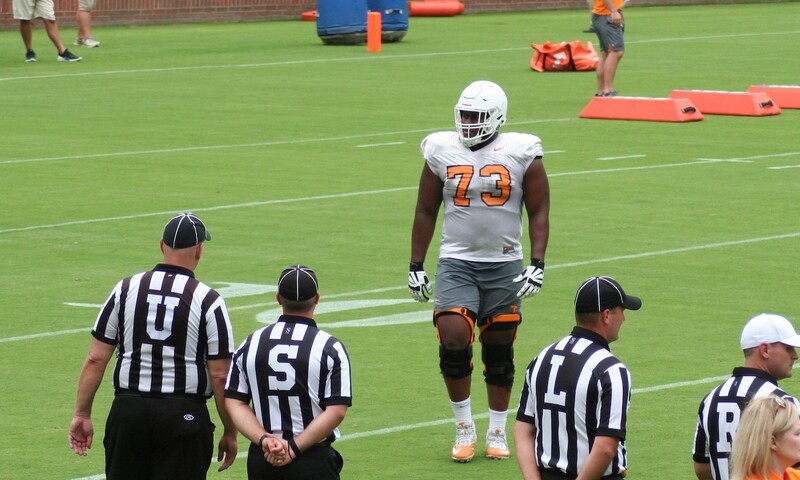 He got first team reps in the Orange and White Game and he could be called on if he shows himself to be worthy. There’s a lot of players even past those that I’ve named so far who COULD be significant pieces on this line (such as Nathan Niehaus, K’Rojhn Calbert, and Devante Brooks) but the fact is this for everyone involved in the offensive trenches that isn’t named Trey Smith: They have to go and show what they’re made of. And even though I listed guys at specific positions in the projected depth chart, expect lots of movement across the line. The offensive linemen that have spoken to media during the offseason have pointed out that Pruitt and Friend want everyone on the line to be prepared to play in any position. The staff has even gone so far as to pull defensive linemen over to play and get practice reps with the o-line so they will be prepared if the need arises. In 2018, Tennessee’s offensive line is likely going to be an experiment. There will be a good amount of trial and error, testing out different combinations of players in different positions. And much like any experiment, it could end in the discovery of something great, or it could explode in your face. Let’s hope Will Friend can pull off the former.